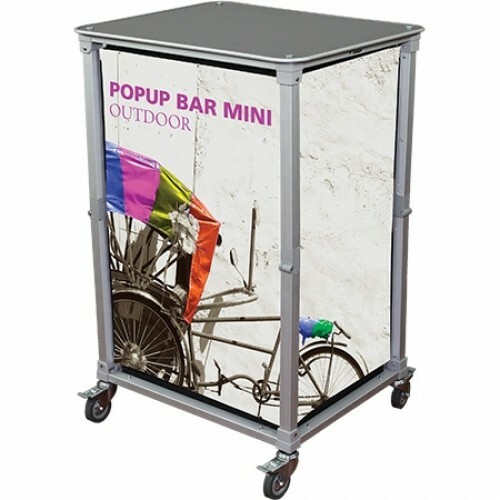 This portable Popup Bar Mini is perfect for any indoor and outdoor events. Use it as a wheeled sampling display, serving station, or in place of a large counter! The pre-assembled aluminum frame comes together by unfolding the legs, and inserting the interior hidden shelf panels. Custom printed oxford fabric graphics on the front and sides will win visitors over as you provide an effortless serving experience. Comes with a handy carry bag! Shipping Dimensions: 26" x 22" x 7"
Gopher Pop Up Counter with Printed Graphic, Fast SetupThe Gopher is a Popup Counter sets up in less ..